Open invite to everyone. Listen to the call and pray with us in spirit for God to save the USA. Then click “Sign up!”to join us in prayer. We will email you the call in phone number along with date, time and other relevant info. The United States of America is in trouble. That much we can all agree on. The finer details are debatable. But it doesn’t matter who’s to blame, Democrats, Republicans (or any other political party), the current President, your local government, The Fed, major corporations, Big Pharma, etc… The main source of the problem comes down to all of us, “We the People”. The USA was founded on Christian principles. As a nation, the dominant religion has been Christianity (including all forms and denominations). God and His commandments were always at the core of our foundation and the decisions we made. And we as a nation prospered in every way because of it. God’s Word, the church and strong religious beliefs used to be integral to most Americans in their personal lives. As the people in our nation have been slowly drifting away from God, their churches and away from basic Christian values, our nation as a whole has been suffering. All these and more can be solved by faith in God and by all agreeing to hold ourselves and each other accountable to good values. is our separation from God. When we as individuals are close to God then we personally enjoy the benefits of His blessings. When we as individuals are all close to God and come together as a group, as in a nation of people, then we collectively enjoy God’s blessings and protection. The people in our once great nation have been slowly drifting away from God over the last 100 years. The evidence (symptoms) of this separation can be seen in the eroding of our family units, broken families, soaring divorce rates, increased abortions, increased domestic violence, crime in the streets, governmental corruption, etc. As a nation we are in a financial recession heading into a full depression. A full financial collapse is imminent if we stay on the same path of disobedience to God. The people of our nation are suffering increasing instances of severe environmental conditions such as hurricanes, tornadoes, floods and earthquakes. These are all symptoms of a much larger problem looming over us. That problem is separation from God, His blessings and his protection. Although it’s true that individuals who remain close to God are protected. 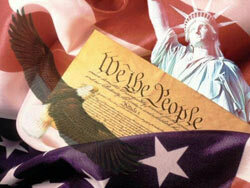 But we live in a nation among others who are not protected, who are straying from God and His righteous values. This falling away of others affects all of us. The Old Testament is full of examples of where God’s people strayed from Him and then reaped the consequences of their actions: Famine, pestilence, drought, poverty, wars, invasion and slavery. Our nation is on the brink of disaster. We are seeing some of these very same things happening to us right now, and it’s only going to get worse unless “We the People” repent and turn our hearts back to God TODAY. Click here to read more of the why you should pray with us on Aug 6th- why to spread the invite with others you know- and how to join in prayer Aug. 6th. May you be humble and bold. May you be peaceful and blessed. Thank you for spreading this invite so God can perform a mighty miracle in our day and time! For professional women who are on the go at work will benefit from this information on how a specific prenatal vitamin can help greatly reduce and even stop morning sickness. Women executives and career gals typically want to have the family and their business. Learning how to balance life and family takes time. One of the easy things a pregnant working female can do is be in leader in her own life by choosing to feed her baby and body with safe, quality prenatal vitamins. The info on this link below provides a cost effective, convenient way for busy working pregnant women get the nutrition they need- and get relief from morning sickness at the same time. Prenatal Vitamins Offer Relief from Morning Sickness. For those of you who know me, I am not one to create drama. However- in this case, situations in the world are changing and this is an unusual circumstance that many of us here may be affected by. We don’t have control over the weather conditions from the other side of the world, or their ravages that are impacting many… but we do have control over how we take care of ourselves. In this instance, I feel a little education will go a long way to give you a choice and options should you choose to be proactive to nourish and protector body as best as possible. With the ongoing news, and increasing concerns about more nuclear explosions in Japan due to the recent tsunami- for those who want to take some protective measures to strengthen your body-and more importantly, do what you can to protect your thyroid, here’s a bit more information for you. Seems that the first part of our body to be affected by nuclear fallout is the thyroid gland. The bigger concern, though is how to protect the thyroid from being ‘filled up’ with nuclear waste. The thyroid needs iodine. Iodine is found in abundance in seaweed, kelp, cod, along with a handful of other fishes. Nature’s Sunshine has available high-quality kelp, fish oils, and a product called Algin. Algin is made from a brown seaweed. It is mucilaginous and bulking. That means it gets slippery inside of you, and it has a high fiber content so it bulks up inside your belly. The good part about this is that it coats the inside of your digestive system, and the bulk fiber helps to have more frequent healthy bowel movements. Algae and other seaweed is exceptionally nutritious. It contains carbohydrates, oils, proteins, vitamins, trace elements, minerals and fibers in balanced proportions. It is especially well known for it’s high levels of minerals (salts) and trace elements (metals), which are highly beneficial to human beings. Algin is often used in food and pharmaceutical preparations. Algin offers especially good protection from many kinds of modern day pollutants, carcinogens, and toxins. Algin prevents living tissue from absorbing radioactive materials. Algin also encourages the action of dietary fiber, by supplying nutrients, and by normalizing bowel functions. Seaweed has been used as food by both humans and animals for thousands of years. Today, it is eaten in many Asian countries as a vegetable but when the knowledge of it’s high food value spreads to the western world many people have begun eating algae in tablet form. Alginates have been widely used as food additives and in the cosmetic industry. If you have any questions about this post, or like assistance in place in order, feel free to contact me. My heart and intention with this post is to educate you- to help remove fears or concerns you may have. God always provides an answer if we look, listen and take action. May you be blessed in your day & steadfast in your walk. Take two capsules three times daily between meals. Drink two glasses of juice with each serving. Any type of 100% juice will do. Juice should be taken with algin as it causes the algin to gel in the body and the acidity of juice helps breakdown the algin for assimilation. Remember, TWO glasses of juice with each dose. Notes: These statements have not been evaluated by the Food and Drug Administration. This product is not intended to diagnose, treat, cure or prevent any disease. If you know of a sister, friend, wife, co-worker who has morning sickness, this article might help. The site I reference will help her too. Morning sickness is no fun- and there’s ways to get rid of it. I have been pregnant twice. I have two healthy, growing boys. What Symptoms Of Pregnancy Have You Experienced? Early on in both pregnancies I experienced morning sickness, feeling sleepy and achy. As the pregnancies went along, the need for sleep increased. I noticed hormonal changes, but not the way most women do. For me I became very forgetful and a bit slower in my energy. Towards the end of the pregnancies, the need for increased sleep was consistent. The closer to the birth of the babies, the more I found myself going to sleep earlier. Food cravings were minimal. My pregnancy food choices were as clean as I could get them. I think that helped me not have too many symptoms. Good vitamins helped too. What Have You Tried To Cope With These Symptoms? For both pregnancies, I tried to eat food that had as little sugar in them as possible. It was important to me to not have caffeine either. The less sugar and chemicals in the body, the easier your pregnancy should be. I made sure that I ate a good amount of raw vegetables, fruits, and kept my protein intake high. The bulk of the vegetables helped prevent and ease any kind of constipation. The fruits helped with vitamins and the protein gave me strength. Using high quality non GMO meats, dairy and soy gave the babies good proteins to grow with. I also made sure that I ate a lot of dark green vegetables for Vitamin K, raisins for Folic acid. Since so much of the food we buy has been grown in soil that is nutritionally depleted (when compared to many years ago) I found that taking daily Folic Acid, along with a really good, chemically free Prenatal Vitamin helped get rid of my morning sickness. In fact, the prenatals that the doctor gave me made me sick to my stomach. I found a high quality prenatal vitamin online and as soon as I started to use it, my morning sickness stopped right away. My friends who were pregnant at the time changed their prenatals- and they had the same relief from morning sickness too. Red raspberry tea and either ginger tea or fresh ginger also helped with my pregnancy symptoms. At night, I made sure to take a really quality Calcium with Vitamin D mineral. That helped with leg cramps that would start if I was on my feet too long. Taking the Calcium at night works with the body so it absorbs easily. I found that I would wake up refreshed after a good nights sleep. Listen to your body. If you need sleep during pregnancy, sleep. Stay physically active during pregnancy to help keep your muscles strong, fluids moving through you and the baby. At minimum, walk daily. Drink plenty of water, plain water. This Thanksgiving weekend I spent time in the desert with friends, family and new acquaintances. 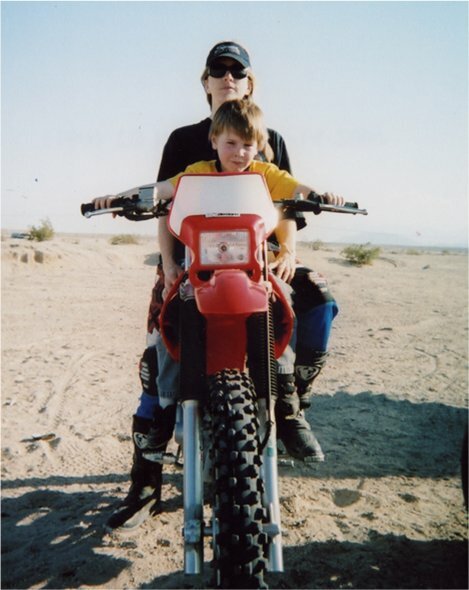 Part of our personal family tradition has been to go out to the desert for the days after Thanksgiving to ride, play in the dirt and relax. This weekend I made the comment to my husband that the desert is a great exfoliant! At first I was talking about the sand on my face. It was windy at times and I was recalling that each time I return from a desert ride, after a hot shower and cleaning off of all that sand, my face and skin were always softer and brand new. The sand is a natural abrasive, so when you wash up, it gently removes old skin cells leaving new, baby soft skin that has been underneath to the surface. As I was reflecting on the adventures of the weekend, I had some insights on just how much ‘exfoliating’ was done- and how important this concept is for your growth in many areas. When you ride in the desert- if you don’t pay close attention to visual markers of where you are, it’s really easy to get lost. 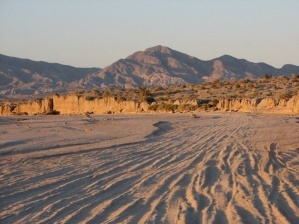 In fact, there’s more than 80,000 acres of desert to get lost in where we ride!! The biggest ‘aha’ that came to Quinn was when we got up high on hills and saw the really big land marks that you could see for miles around. They had always been there to guide, but now he saw them from a different viewpoint. We were able to use these as part of tracking our way back to our campground. I knew where we were, where we needed to end up at, I knew the markers and I was decently familiar with this chunk of land. However- I left with out my cell phone (risk taking) and I got lost on purpose. To push myself into a new level of trust of the benefit you get when you step outside a comfort zone. Also, to teach my son that he too, can lead – and does. We had to rely on each other for team work and support. We had to rely upon each other to endure. (We rode for a very long time- and for an 8 year old on a smaller bike, this ride was quite a trek.) We had to have confidence that if our quads broke down, we could figure out how to fix them on our own. We also had to be ready to do what ever it took to get back to camp safely, before dark- no matter what. This trek in the desert is starting to sound a lot like daily life….. There are real obstacles and threats in the desert. At night fall, it gets cold- quite cold. When the sun goes down, it goes down fast. There are real threats with wild animals out there. Yet- in the desert, like in daily life- you cannot change those obstacles. Obstacles will always be there. It’s how you chose to overcome (or prevent being injured or sidetracked from) those obstacles that count. 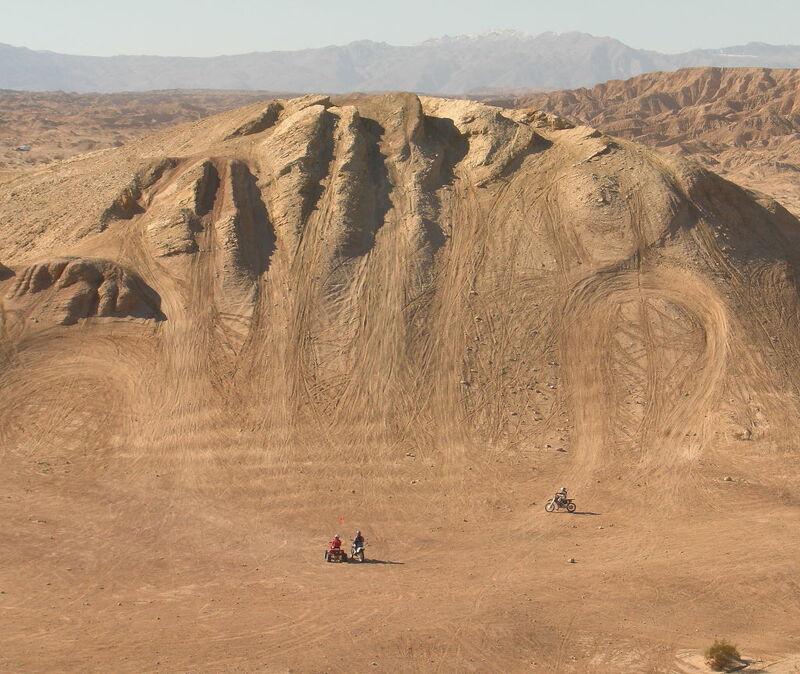 The Big Hills and Soft Sand – Take the risk or ride around them? I used this ride to exfoliate a few hang ups I still had about big hills and soft sand. On many rides in years past, if I saw a big hill (looked like a ‘mountain’ in my mind) early on, I would choose the safe road and ride around the bottom. I always got to the other side safely, albeit, I missed the adventure and camaraderie of the guys who took the hill. My logic was “I didn’t mind going up them- I just didn’t like the ‘coming down’ part.” In taking this attitude, yes, I was safe, but my rides gave me minimal change to grow. In recent years, I’ve become much more confident in my riding skills, so those big hills and soft sandy areas were still sometimes nerve wracking- but I would do it. I would follow others up the hills and through the sand. I watched where they placed their wheels so I could still be safe. I could see what to do.. and what not to do. On this trip though… I was the leader. The only way to get back to camp was to, on my own, go over ‘them big hills and through the vast amounts of soft sand (soft sand makes it easy to fall on a bike). I had to lead myself and my son back to camp. So… I exfoliated my remaining nervousness concerning the threats and potential dangers with those obstacles and just went for it. Funny thing… those hills and patches of sand were only scary in my head. Going for it, I proved to myself that I can still push through those comfort zones, remove fear and increase confidence in my skill sets along the way. I had no one to rely on to follow their path. I had to cut it on my own. At the same time of exfoliating any remaining hang ups I had about that, I taught my son that he could do the same. Learning lessons like this show no respect to age- it’s all about attitude and a heart that is willing to try. Just like in life, when presented with a big choices- do you take the easy way around the bottom of the hill, never learning anything new – never giving yourself a chance to grow… or… do you bite the bullet and ‘go for it’? What is it in your life you need to exfoliate? What can you gently wipe away the layers of old thinking on to reveal new, healthy perspectives and attitudes around to help you achieve your goals? About ½ way through our ride, my son and I paused for a moment. I was looking around at the markers, choosing our next path. He pulled up beside me and asked “Mom- do you have your cell phone?” He was asking me if I could call back to camp and ask for help. I told him, “Nope- I do not have the phone. Instead, we have the Ultimate GPS system” otherwise known as the “God Protective System”, the “God Planning System” and the “God Positioning System”. My son is learning the Word, and he knows that God’s word says that we can be in direct connection with God at all times if we walk by the Holy Spirit. On this ride, I had been in constant prayer with God, thanking Him to show me where to go. I simply talked to Him with thanks, kept my belief strong that we were safe, and then paid attention to the markers that God showed me. God is with us at all times- we should not just turn to Him in times of trouble, sorrow or desperation. If it takes us breaking down (emotionally, physically, spiritually) to come to Him- then that’s great. (We get ego out of the way.) However, God is there for us ALL the time- if WE go to HIM. HE is the ultimate GPS system and can help us navigate through, over, around obstacles of any size, any terrain under any circumstances if we let him. It takes us being still in the moment, being willing to step out of our comfort zone and go for it! Walking with God takes the willingness to take a risk and trust in Him and His logic. HIS logic is not mans logic. HE will show you the markers you need along the way to navigate your path with safety and success… and you will be able to exfoliate those layers of fear, worry and doubt along the way! Here’s to more sand in your face as you choose to ride the big sandy hills! Ok- so my friend and I met over coffee three weeks ago… and I couldn’t stop staring at her face. She just turned 51 – and her skin was AMAZING. (I have decent skin- but not like hers. ) So… before we leave she hands me this bottle and says it’s a skin repair system she’s been using and I should try it. To be nice… to her, I accept- but not sure what to expect. I do what she says, wash my face before bed and then roll this stuff on. Wake up in the a.m. and wash it off. Let’s just say- I have been secretly doing this for three weeks- and now I have to share!! Day one: I saw a big difference in how my face looked and felt. Each day.. keeps getting better. But today….. HOLY COW!! For those of you who’ve known me… I’ve had a big, nasty scar to the side of my left eye since I was 4. (I was attacked by a German Shepard). Most people don’t see it as I hide it a bit with my hair. Many stitches and it was big and deep. TODAY – after only three days of putting this skin repair product specifically on this scar…it is about 1/2 gone!!! I won’t tell you how old I am- but let’s just say, I’ve had this for many decades!! Now- I see it disappearing and new healthy skin growing where it was. I have to share this with you – and if you want to know more- see this link http://www.mynucerity.com/rxnaturally/product.html and then , call me, email me- and let’s talk. I am so thankful to my friend for giving me that bottle!! It’s my turn to pay it forward. Here’s to amazing skin days and watching how I can lead the way to help others feel and look fantastic too!